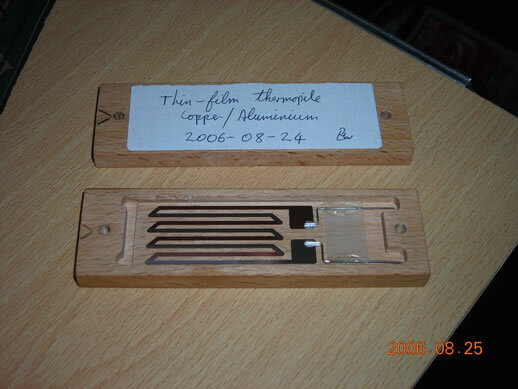 This was an attempt to make a vacuum-deposited thermopile, about the only device that's possible to make without fancy conditions and materials. Although the best materials would be something like copper and nickel, I chose to go for copper and aluminium because I had them to hand. One preliminary note - I discovered that the metal shield I'd put inside the belljar was trapping a lot of gas on its surface and creating a much poorer pressure. I simply removed it! First of all, I made a disc to fit inside the substrate holder. 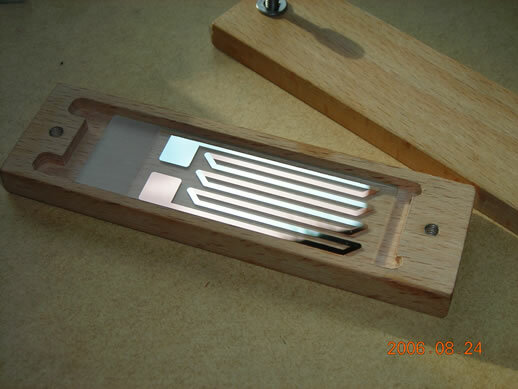 The I milled out a rectangular slot to take a standard 3"x1" microscope slide. Next I needed to make the masks. 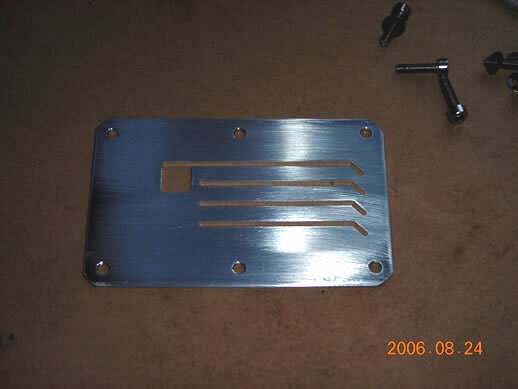 These were made from 1.2mm thick aluminium sheet. 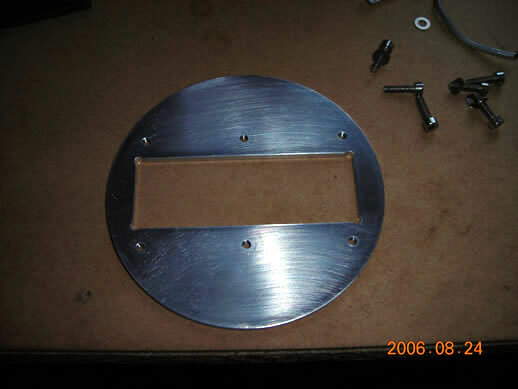 The slots were milled out on the CNC milling machine. Shown below is one of the masks, and the mask attached to the slide holder. The microscope slide simply sits on top of the mask. 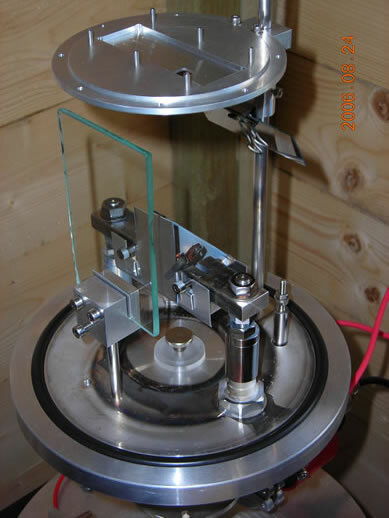 The next shot shows everything set up in the vacuum chamber, ready for pumpdown and coating. 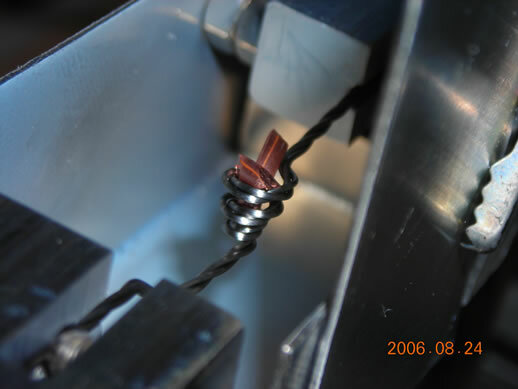 Note the little shield which is mounted around the filament itself. 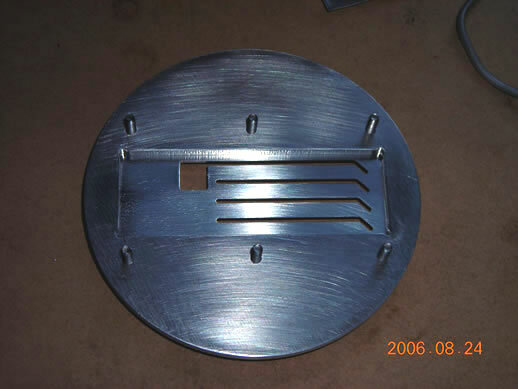 This helps enormously to reduce the amount of stray metal produced. Also notice the microscope slide attached to the substrate holder support post - this functions as a mirror to view the filament as it's evaporating. This is a closeup of the bits of copper in the filament. One mistake I made with the copper was I just chopped off a bit of ratty old copper wire that was lying in the shed. This must've had a whole load of gas trapped in it because the pressure in the chamber rose dramatically when I evaporated the copper. Before using a new filament, always run the filament to heat under vacuum to get rid of gas trapped in the filament itself. Rough vacuum (7e-3 mBar) is sufficient. The next is a shot of the plasma cleaning in action. I had already flamed the microscope slide, but I thought it best to give it a little plasma clean as well. Finally, I evaporated the copper. 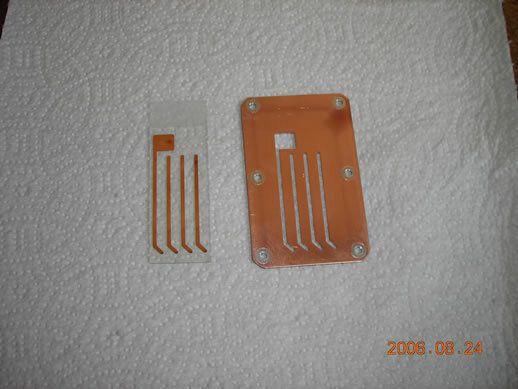 Here's the copper tracks on the microscope slide, along with the mask used. I then swaped the masks over, changed the filament to the aluminium one, and started it pumping down again. While it was pumping down, I knocked up a little box to hold the microscope slide in once I'd finished. 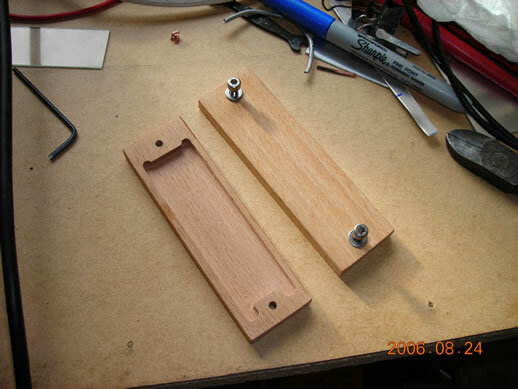 It's simply two bits of beech wood with a recess milled in one of them. And here is the microscope slide with both sets of tracks evaporated! Notice how they overlap to give a series connection. Here it is with wires attached. I just used conductive paint to make connection. The region of the slide where the wires are glued was sandblasted prior to coating to give the epoxy a better grip. The wires are the right spacing to plug into a 0.1" breadboard. The first thing I noticed was that the two sets of tracks didn't appear to be connected! Even when the aluminium overlapped the copper, there was no connection. I think this is due to the think copper oxide layer between the two. Luckily, a light burnish with a matchstick was enough to make connection. There's about 12" of tracks folded onto that little slide. With the whole slide cold, the end-to-end resistance was 79.4 Ohms. When the whole slide was heated with a hairdryer, the resistance increased to 81.2Ω, as you'd expect. It returned to its previous value when the slide cooled. Now for the voltage produced. (Refer to the picture above for "left" and "right"). When the left set of junctions was heated with the hairdryer, a voltage of about +500μV was produced between the terminals. (Unfortunately, I can't remember which terminal I had grounded). 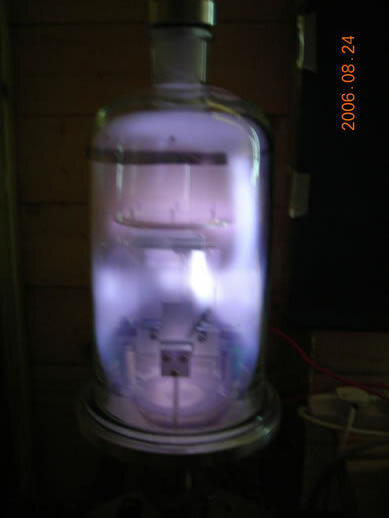 When the other right-hand set of junctions was heated, the polarity reversed and the voltage produced was around -500μV. Well, it ain't a great output, but at least it works!